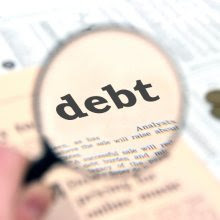 If the US debt to the penny as of today is $14,620,196,583,424.20, and the population of the US is 313,232,044, with about 20% being children--let's make it 25% just to be safe--leaving us with 234,924,033 adults, then if every American pays $62,233.72 the national debt will be taken care of. But aw shucks, I don't have that much. A trillion has about three more 0s than I remembered it having. $6,223.37 for the next ten years?